So Many Words: Welcome, Parker! This is my new friend Parker. He was born yesterday at 7:16pm. 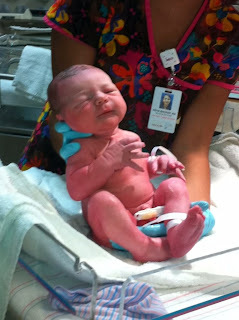 He is 7lbs, 5 ounces and is 19 3/4 inches long. I'm super proud of his mama, Sarah, who had a very long day and did such a good job. Oh, I want to squish him. Yay!! Congrats to the Shalley fam!